With millions of Americans still out of work and receiving unemployment check, one questions comes to mind, do you have to pay taxes on the unemployment benefits received? And the answer is yes. The government considers a payment you receive as income and therefore wants to tax you on that amount. How to request to have taxes withheld from unemployment check? If you received unemployment benefits, you can choose to have taxes withheld from them. It works as if you were receiving a regular pay where employer simply withholds portion of your salary towards tax contributions. Whether or not you decide to have taxes withheld will depend on your situation at the time. When you receive unemployment benefits check, it is typically less than what you used to earn and committing additional funds to the future tax obligations may cause economic challenges. Not having taxes withheld simply means you’ll owe the IRS when you file tax return. Intermediate solution is to pay estimated taxes every quarter. If you choose to have taxes withheld, file Form W-4V. 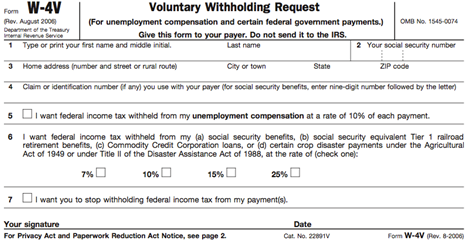 Although the form mentions different withholding percentages, you are only allowed to have 10% withheld. Other options apply to Social Security benefits or Commodity Credit Corporation loans. If at any time your economic situation changes, you can request not to have taxes withheld anymore.